Loading at Mukelteo, right? A sight that is long gone. In other news, tomorrow, if the maintenance schedule speaks true, the Cathlamet move to the Triangle. I think that a ferry can't be called a true Vashon ferry until it takes out one of the route's slips. ...The Cathlamet will fit in just fine. Vell... Cathy ain't here yet. Hope she makes it to Vashon soon. I took that pic from the passenger building at Clinton. She will be here today. Due to vessel repositioning, the galley on the Issaquah will close at approximately 1:00pm today. The Cathlamet will replace the Issaquah, and its galley will be closed for the remainder of the day. Regular galley hours will resume Thursday, November 6. 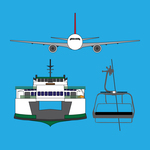 This alert was sent on 11/5/2014 at 12:09PM to subscribers of the Fauntleroy (West Seattle) / Vashon / Southworth route. I just rode the Cathlamet. It was really weird seeing her in the dock at Fauntleroy. The Cathlamet belongs at Mukelteo. I really wish the Kittitas was reassigned instead. 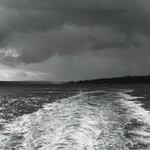 But, nevertheless, it was a great trip, and the Cathlamet is a welcome addition to the Vashon route. I'm glad I had the opportunity to ride her tonight, and I look forward to seeing how she preforms on the route. Personally, I'm betting that within a month, one of the Triangle's terminals is going to be demolished and the Crash-ram it will be to blame. Another name I've heard is CRASH-LA-MET. Every time we come down to the Edmonds waterfront, we see a flip sign located prior to the entrance of the overflow slot (east lane). We called it the "CRASHLAMET SIGN". 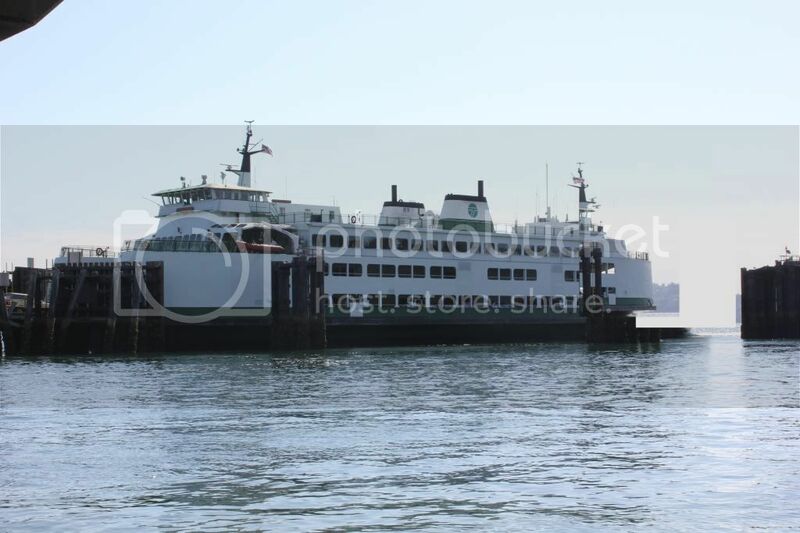 When the Mukilteo dock is out for any substantial length of time, I think they flip it open and display "Whidbey Island Ferry" and traffic going there are directed to enter that slot. Now we need find another name for that flip sign. One of the next times I pass through, I'll take a pic of it to show you folks. 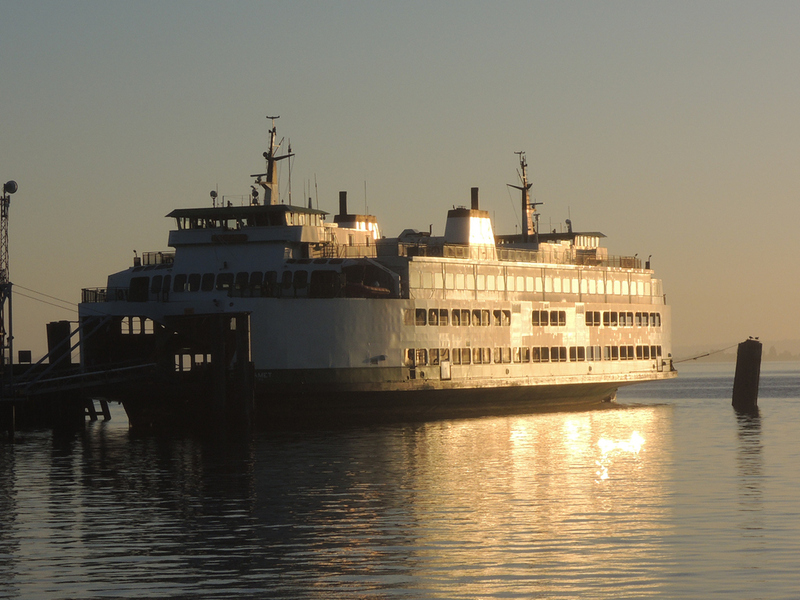 Whenever the Mukilteo dock is out, Edmonds is the alternate mainland terminal for Whidbey's southern ferry route. It took the Steel-Electrics 55 minutes to complete a run between Columbia Beach and Edmonds (I timed a crossing aboard one). About 40 minutes for the I-Class. You're getting a double dosage of adventure on the NVI run now. Do you remember the ISSAQUAH's first birthday antics she did there on December 29, 1980? I do! And I was on Seattle's waterfront seeing the aftermath. Not saying it won't happen, but the Cathlamet has had all the problems ironed out that made it demolish docks. The incident in 2007 was a navigational error and fog. Got this photo on July 8th when arriving in Bremerton, I like how the nameplate looks in that light. 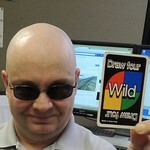 Four Months since I posted my last walkthrough tour, Yikes! But, my long-anticipated Cathlamet Walkthrough is finally online. 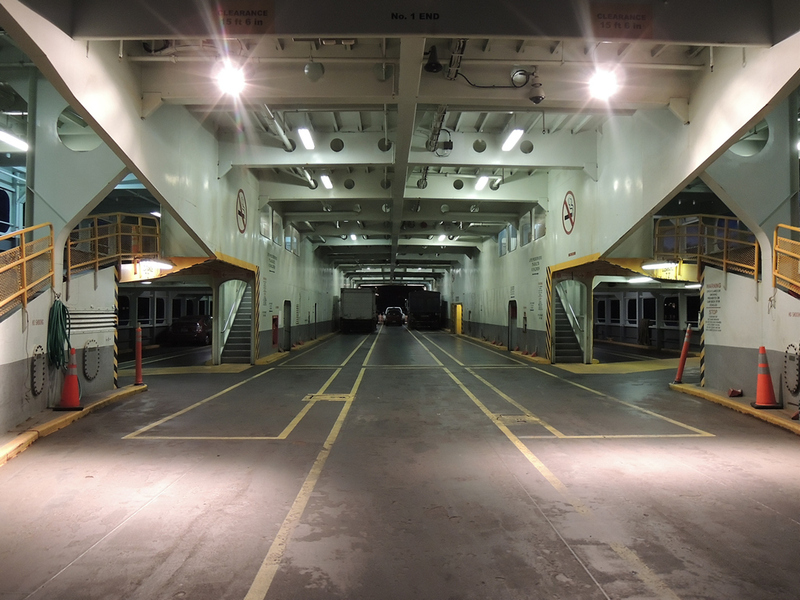 Rather empty car deck, 6:20 AM sailing from Vashon on 02/15/2015. Notice the fencing on the ramp rails. The Cathlamet is the only Issaquah 130 Class vessel to have this. I'm gonna be honest. It should have been the Kittitas to move to FVS. Mukilteo Clinton is truly where the Cathy belongs. It should have been the Kittitas to move to FVS. Mukilteo-Clinton is truly where the Cathy belongs. I'm just acknowledging the brilliant pun in the above, re the use of the word "seconded" when referring to a ship being moved temporarily to another route. Same spelling, slightly different pronunciation, but a relevant meaning. Well done, in keeping us intellectually stimulated through vocabulary. OK,. 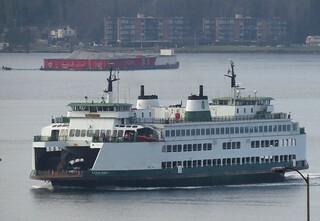 I'll bite (I'll probably regret this later) - what difference does it make which vessel is at F-V-S and which is at Mukilteo? Both vessels are pretty much the same except for the interior decor. Cathlamet had a reputation (at least to me) as a true Mukilteo Ferry. She was there all her life. She belongs there. Just like the Klahowya was a true Vashon Island boat. Kittitas, on the other hand, just doesn't have the same legacy at Mukilteo. That's all. She didn't get to Mukilteo until she was almost two years old, in 1982... and a little relief time in the San Juan Islands around 1990, after the re-fit. Otherwise, it's been a Whidbey boat pretty consistently. I think 32 out of 35 ain't bad, myself. Whilst I loved the KitCat combo speaking as a 35yr or so rider of the route the best reason for Cathlamet to stay up there was the display in the cabin of the wheelhouse equipment from the Olympic. That was setup and worded as a very "Whidbey specific" exhibit, but could frankly easily be transferred to Tokitae or Kittitas. Hey, that is my name! 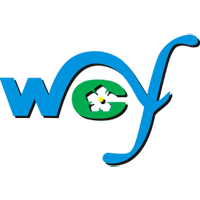 Thanks Flugel for your kind supportive comments. And my tour on the Cathlamet. 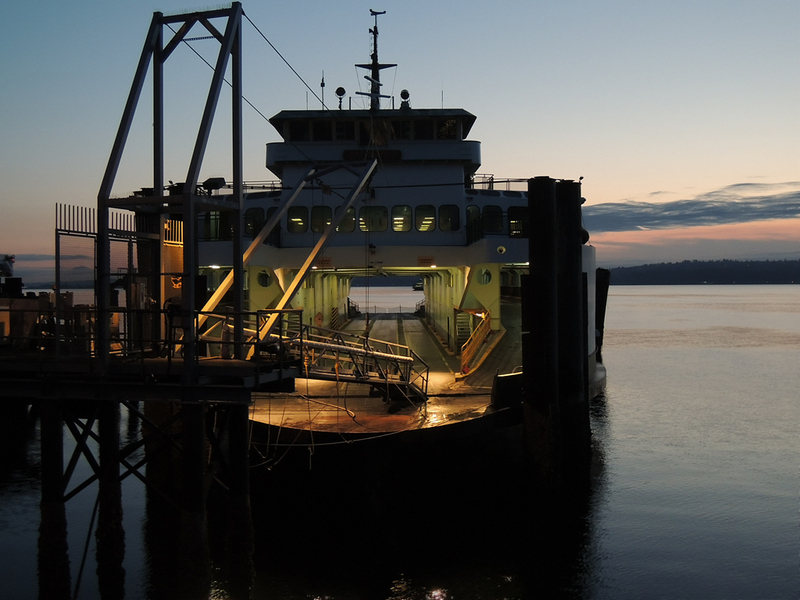 M/V Cathlamet at Vashon ferry terminal in the tie-up slip, morning of 07/04/2015. 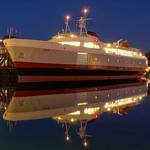 M/V Cathlamet at Vashon ferry terminal tie-up slip, morning of 09/05/2015. A small section of the M/V Issaquah is barely visible on the left side of the picture and the M/V Tillikum can be seen in the center tunnel.